I`m Amanda. I`m 15 years old. I live in Switzerland. I can`t very well write english but I hope you can read my letter. I love the twilight-story. 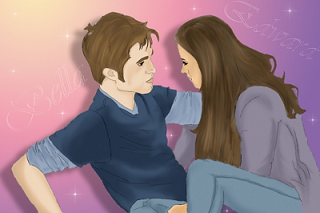 The story about Bella and Edward is so wonderful. I had read twilight, new moon, eclipse, breaking dawn, the book about Bree and the handbook. I love all books and twilight is the first book in my life that I read a second time. My favourit persons are Bella, Edward, Renesmee, Alice and Carlisle. I hope you will finish Midnightsun soon. The start ofthe book is so great and what Edward think is very intresting. Edwards view is so special but I think he is a bit like a normal boy. I think Midnightsun woud be a grat book with a lot of fans. I think all books from Edward`s view woud be intresting. Der Brief ist eigentlich nicht schlecht..
Aber ein paar rechtschreibfehler sind drin.. would! Ja die Fehler fallen mir jetzt auch auf wo wir gerade vergangenheit durchnehmen. Echt gut, nur zu viele Hauptsätze und zu viel I am Satzanfang! Nimm doch Konjunktionen her, dann klingts viel schöner und flüssiger!